The Home Depot is a world-wide known home improvement retailer and it has a very wide range of hardware products. You can really improve anything with these devices and furniture. With over 2000 locations, the Home Depot is the largest store in this category. The brand is in competition with Lowe’s who is the second largest one. Moreover, the Home Depot Ad will always be here with the updates for you to check out new prices. Local ads in the retailer can offer you great discounts. For example, special buys are occasional savings on some popular or promotion items of the home improvement categories. 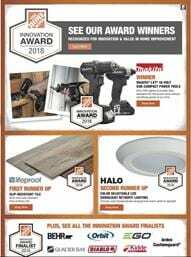 Home Depot Weekly Ads showcases several categories to let you know about what’s a hot deal this week. The Home Depot has 2000 locations in all 50 states. They also operate in Canada. It was founded in 1978 in Marietta, Georgia. Free in-store pickup is one of their cool services. Order online and get your product ready in-store for free. You won’t waste time looking for the item you need this way. Find ideas for DIY projects, special offers, categories of products such as home appliances, building materials, electrical dept., kitchens, hardware, painting, storage, and dozens of more. Home Depot Ad offers amazing discounts. Professional hardware, beautiful colors of paint, and the essential part of your bathroom are on sale. There are even more products in the latest Home Depot Weekly Ad. You can find all the discounts on the ad. Go to the browsable pages of the Home Depot Ad. Find supportive products for your projects, buy award-winning Makina 18V sub-compact power tools at Home Depot. Lifeproof slip-resistant tile, color selectable led downlight retrofit lighting are also a part of the product range. Bath essentials are available on pg 2. You have up to 40% discount on many products. Find faucets, chrome products, chemicals for cleaning, and cabinets for your bathroom. Make it beautiful at affordable costs. Also, a power tools section is available on pg 3. 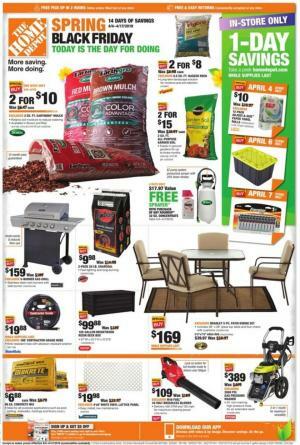 Lawnmower, Ridgid products, 30% discount on different categories are all in this Home Depot Ad. The Ad also has a special buys deals of security systems and smart home products. Google Home mini charcoal, Honeywell T5+ Home 7-day touchscreen programmable thermostat and more are available in this range.